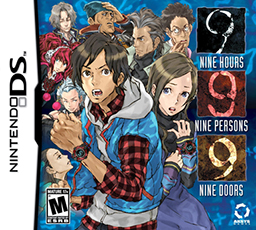 9 Hours, 9 Persons, 9 Doors is the first in a trilogy of escape room visual novel games, the Zero Escape series. This particular entry was initially released on DS, bur was eventually ported to iOS, Windows, PS4 and PS Vita. The game starts off with the protagonist waking up and falling from bed to the floor in a strange room, and no recollection as to how he get there. After figuring out how to escape the room, you (Junpei) meet up with 8 others. A character named Zero comes on over the loud speaker and reveals that the players are participants in something known as "The Nonary Games". They are each assigned a number, and to open a numbered door, they must scan in with their numbered wrist bands following certain rules. If they violate the rules directly, an explosive planted in their belly will go off. As such, one of the puzzles in the game is deciding which team members you will have to join up with to go through a specific door. There are multiple ways to successfully complete the game, but only one true ending. Unfortunately, you also need to play through the game at least twice to see the true ending. So, with multiple playthroughs necessary,we must really consider the strength of the story and pay close attention to the characters. How is the story? Actually, it is very well written, and creates a lot of tense moments. It does a great job with pacing how, when, and what information a player gets as they progress through the game. Each character has a depth that makes them relatable, but some initially come off as very generic when you first meet up, so make sure that you talk to people when you can to flesh them out. You'll be grateful that you did. Most of the puzzles seem pretty fair in that they're not as difficult to figure out as most earlier adventure games, but they aren't structured too differently from those over all. On the subject of puzzles, there are just enough to break up some of the heavy amounts of text, and they are actually rewarding when solved. This isn't primarily a puzzle game, mind you, so it doesn't really do anything all that interesting in that regard. So, is it worth playing? Definitely...but it isn't for those that like more action in their games. Also, it might be best for most people to play the newer HD version of the game released on Windows, PS4 or Vita, as it will provide better visuals and allow you to skip cutscenes on successive play throughs and even have a flow chart that enables you to track your progress. Looking forward to playing the rest of the series...which I will be reviewing here as well. Check back in tomorrow for another review. Thanks.